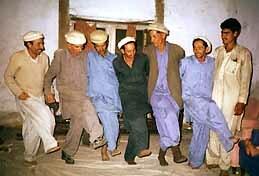 The songs sung in the northern part of Chitral have a characteristic of their own. Most of them are sung in the same style as "folk songs"; singing with the sitar and daff and accompanied by dance, but compared to the songs of the down areas, the melodies are simpler and the poems are cheerful and amusing. Especially a village called Laspur is famous for their music liking and from this area originated the two famous tragedic folk song called Nan Doshi" and Luk Zuur Laspur valley. This two song is sung without any acompaniment of the instruments and often sung in a dialogue style. Aside from these, there are other types of songs. These songs have a different kind of dance compared to the ordinary folk songs. No instruments are used and the dances are of two kinds; northik and pastok. This two kind of special song and dance is also of Laspur origin. northic--With two singers on each end, the dancers form into a long line and dance with their arms on the other's shoulder. Each singer sings a verse alternatively and the dancers join in shouting "oh-ho-ho-ho" or "ah-ha-ha-ha", thumping their legs, kicking their legs high or clutching down on their knee. When the dancing starts, the rhythm of melody which was melismatic becomes strophic and changes into a clear strong duple beat. pastok--In between the two singers three men dance in a circle and clap their hands with the movement of their arms. The way of the song is as same as in Pastok. Most of these songs are love songs and are sang on weddings. According to the tradition, first a northic will takke place to notice the people that the wedding party will start. When the people beging gathering inside the house, then pastok will begin. After that ordinary folk song and sitar playing will start. At the end, when seeing off the bride, the famous lament Luk Zuur is sung..
Actually in olden times these style were performed more occasionally and even in the down areas. But unfortunately, they are dying out. Nowadays they can only be heard in Laspur valley where the people there are trying to preserve them.